This card showcases 2 products that can only be earned. 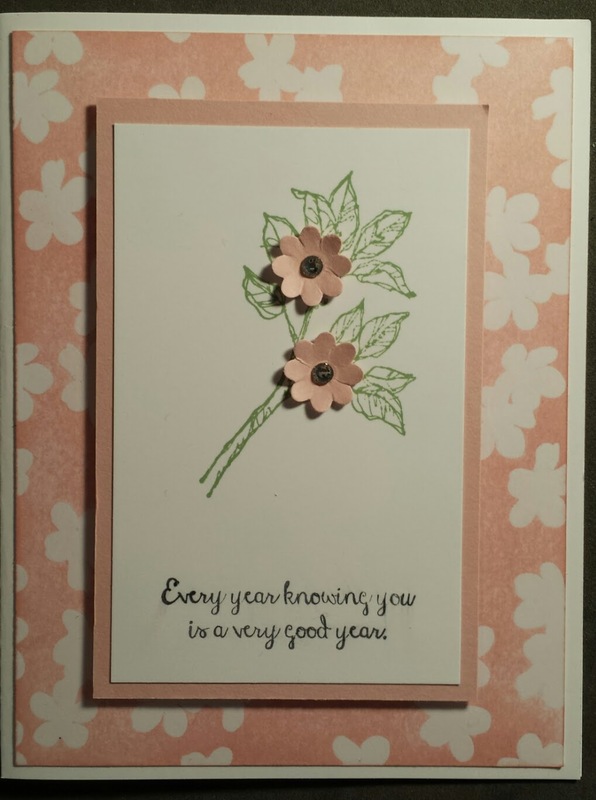 The first is a hostess only stamp set called Bloom with Hope from the big annual catalog. This is a beautiful stamp set that comes with 11 stamps. I have used the branch with leaves and added some blossoms from the Boho Blossom Punch. The flowered background paper is an exclusive Specialty DSP available only during Sale-A-Bration called Irresistibly Yours. You can use your favorite ink colors to color the paper and a white embossed image resists the color to form a beautiful paper. I sponged Blushing Bride on the resist paper for this card. To earn the Hostess set, you need to have an order of $150.00 or more before shipping and taxes. When you reach this level you will be able to select $25.00 of free merchandise. To get orders of this size, you can make one large order for yourself or get together with friends and host an event. If you are interested in hosting an event, contact me and we will work out a plan. Until March 31st, Sale-A-Bration is going on. What this means to you is, not only will those sales earn you free merchandise from the catalogs, but it will also earn you free items from a special booklet with Sale-A-Bration items. For every $50.00, before shipping and taxes, you spend, you earn one item from Sale-A-Bration. Another wonderful thing about Sale-A-Bration is that if you have sales of $250.00, you earn an extra $25.00 in hostess dollars to spend. This is a great time to host an event. You can get together with friends and make a project. When your friends order products during your event, you can earn free merchandise and they can too.